Self-driving holidays are one of the most relaxing ways of enjoying New Zealand’s landscape. Many of our roads are scenic and traffic is low compared to other countries. It’s important that your road trip in New Zealand is both a safe and enjoyable one. 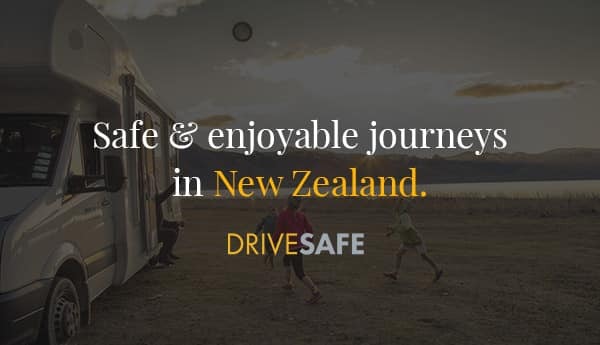 Before setting off you should visit and go through the Drive Safe website www.drivesafe.org.nz to ensure that you feel comfortable with New Zealand road rules. If you feel nervous about driving in New Zealand because of the new conditions, or feel that you don’t have enough experience or confidence then perhaps reconsider whether a self-drive holiday is suitable for you. However, if you’re an experienced, safe and confident driver and know what to expect about driving in New Zealand then that’s great! Before setting off you should test yourself on www.drivingtests.co.nz to ensure that you understand all the different road signs and rules. It is important not to underestimate driving times. Although distances may seem short, our roads often include hilly or winding terrain, which slow down your journey. If you’re used to driving in the city, you should take care when driving on the open country roads. Check the weather conditions before you set off. In New Zealand the roads can get icy or covered in snow at certain times of the year where you may require snow chains on your wheels. Drive to the conditions you’re in, if it’s raining, icy, snowy or windy you’ll need to reduce your speed. Ensure that your driving licence is valid in New Zealand. International drivers’ licenses and any current (and full) English language licenses are accepted. If you’re licence isn’t in English and you don’t have an international licence, then you will need to get your existing one translated. Visit http://www.nzta.govt.nz/driver-licences/new-residents-and-visitors/approved-translators/ to find out the New Zealand governments requirements for driver’s licence translation. Transnational offer a NZ certified license translation service. You can contact them on www.transnational-ltd.co.nz and they will arrange to get your license translated and sent back to you via email. To find a driving route for your New Zealand holiday, please visit the following website. Maybe you know where you want to go, maybe you don’t. In either case, your best-fit driving route is only a few clicks away. Designated camp sides without toilet – these are only accessible to SELF-CONTAINED CAMPERS! The tolls are between $1.50 to $2.50 and you can pay your tolls by either calling the NZTA contact centre on 0800 40 20 20 (within 48 hrs), online at http://www.tollroad.govt.nz or directly at one of the petrol stations close to the toll roads in cash or via credit card. Please note failing to pay your tolls will see you being charged the fine as well as admin fees. If you are travelling between the North & South islands you will need to use one of the ferries – and yes you will need to take your campervan on the ferry. The ferry crossing takes around 3 to 4 hours can costs $180 to $300 depending on size of campervan. For more information please contact Blue Bridge Ferry or Interislander Ferry. New Zealand is one of the first places in the world to see the new day, 12 hours ahead of GMT (Greenwich Mean Time). In summer New Zealand uses ‘daylight saving’, with clocks put forward one hour to GMT+13. Daylight saving begins on the first Sunday in October and ends on the third Sunday of the following March, when clocks are put back to GMT+12.